When you turn the corner into Brick Lane in London's Shoreditch, the whiff of aromatic spices and strains of Bengali pop music are unmistakeable. A busy, vibrant street, this heady mix of East London and the Indian subcontinent was also the scene of a noisy and passionate protest on Sunday. 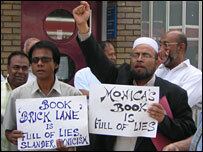 Some 120 members of the Bangladeshi community from London and beyond marched in protest against the forthcoming film adaptation of Monica Ali's novel, Brick Lane. The book is about a Bangladeshi woman sent to London for an arranged marriage. But some local Bangladeshis claim the novel insults them specifically, by being named after the street in which they live and work. They say Ms Ali portrays Bangladeshis as uneducated and unsophisticated, and repeatedly mention a passage which they say has Bangladeshis coming over to England in the hold of a ship and with lice in their hair. This community first complained vehemently when the novel was first released in 2003 to much critical acclaim. But the attempts of Ruby Films, makers of the forthcoming movie adaptation, to film exterior scenes in the street itself have re-opened wounds that have never really healed. The film-makers have since abandoned their plans and will now shoot the footage elsewhere. A small group of mostly middle-aged Bangladeshis, all men save for two women, gathered in Brick Lane in the warm afternoon, holding a banner and hand-written posters. Assurances were given by local businessman and protest organiser Abdus Salique that the widely-reported plans to burn copies of the book were incorrect. Soon chants began, and slogans such as "Community, community, Bangladeshi community" and "Monica's book, full of lies" repeatedly rang out. Numbers began to swell, and everything seemed orderly enough until a young Asian man stepped forward to ask if anyone had actually read the book. This provoked a furious reaction from one of the protesters, who shouted and moved toward the dissenter. He was swiftly stopped in his tracks by a hug from Dr Hasanat Husain, one of the organisers of the protest, and the incident quickly cooled down. Dr Husain delivered a short speech in which he explained how the Bangladeshi community felt about Ms Ali's novel. "A book has been written, that has greatly offended the hard-working, industrious Bangladeshi community," he said. "This hard-working community has been offended by lies, slander and cynicism. There should be a limit to what you can write or say. "You can write fiction, but you cannot use names that are reality. The reality is Brick Lane." The banner-carrying, poster-waving and slogan-chanting group then moved off down the street itself, leaving behind a small group gathered around a verbal sparring match between two Asian men, one of whom is Shochall, Mr Salique's 27-year old son. "If this film is being made here then it's taking us back another 10 years," he said. "If you're going to write certain things then don't upset people. That's all we ask. It's upsetting our elders and giving us a bad name"
Shochall admits to not having read the book, but says he has read "bits and pieces" of it while having other sections explained to him by others. The protesters had taken over Brick Lane by now, and were being followed by a small handful of police officers who strolled casually behind, at a distance. One officer, however, did spring into action when a bit of pushing and shoving broke out between a protester and Dan Simon, 28, of south-east London, who admitted he was shouting and remonstrating with the marchers. He was pulled to one side and given a bit of a talking-to by the policeman. 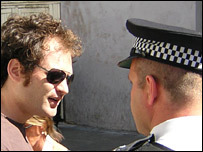 Dan later said he was annoyed the film-makers were "thwarted" by the Bangladeshi community. "The film should be made, it's not specifically against Islam or the Bangladeshi community itself. "A lot of these people will not have read the book and it's really not that inflammatory." It was quite noticeable that there were almost no women directly involved in the march. One of the two who did march was Salina Akhtar, 41, who lives not far from Brick Lane. She said she didn't know why women were not at the protest, but said the female members of the Bangladeshi community were upset by Ms Ali's novel. Muhammad Shahabuddin, 56, from Plaistow, London, said the lack of female representation was because "Muslim women are very conservative and they don't feel comfortable coming here. "If there was a protest just for the women then they would come." However, when this suggestion was made to Dr Husain, he spoke of his "frustration" at "stereotyping" of the community. The reasons there are few women protesting about a book and a film which is centred around a woman's life, he said, is more mundane. "This event was organised at short notice and obviously our families have children. So who looks after them? "My wife wanted to come and face this, but at the moment I have guests." 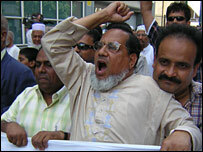 Passer-by Andrew Insley, 26, who lives in Tower Hamlets, watched the protest with interest. "All this is making me want to do is read the book and watch the film," he said.